“There was a hunter who spotted a wolf in the wild. As he was about to shoot it, he noticed the wolf’s green eyes and fell in love with them. He decided to bring the wolf home. He used a tranquilizer on the wolf and got it to his farm. Before the wolf could regain consciousness, he kept it in an area enclosed by an electrified fence. When the wolf woke up, it was surprised. It rushed towards the front and got a shock as it touched the fence. It ran back, left and right fence and got the shock each time it touched the fence. Now the routine was it will remain 1 foot away from the fence and walk in circles all day. One day it rained heavily. The rain caused a short circuit in the fence. Many months later the wolf saw a snake approaching from outside the fence. Wolf was confident that it is safe from the snake, its natural enemy, inside the fence. To its surprise snake slithered over the fence, came inside and moved towards the wolf. Most of us are like that wolf. We love our comfort zone and the boundaries set by others and circumstances. We accept those boundaries and do not venture beyond. What is your electric fence? Do you belong inside the fence or in the wild of your true potential? Remember: the wild is waiting for you. Time has come. Here’s to your true wild potential!! With every new year, most of us wish for greater success for self and dear ones. 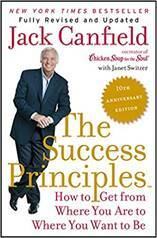 Here is a book that will give you some key pointers – The Success Principles: How to Get from Where You Are to Where You Want to Be. The insights from this book are definitely useful for any sales professional but also for all others at any stage of career or studies. One of the principles that I like was on rejection, a concept that doesn’t exist in its true sense. If you ask for something and get a NO, you are still where you were, no worse off than not having asked. Just asking increases the probability of getting what you asked. Whenever you ask anyone for anything, remember the following: SWSWSWSW, which stands for “some will, some won’t; so what – someone’s waiting.” Some people are going to say yes, and some are going to say no. So what! Out there somewhere, someone is waiting for you and your ideas. It is simply a numbers game. You have to keep asking until you get a yes. The yes is out there waiting…. One of the most important principles of success is persistence, not giving up. Whenever you’re asking others to participate in the fulfilment of your goals, some people are going to say no. They may have other priorities, commitments, and reasons not to participate. It’s not a reflection on you. Just get used to the idea that there’s going to be a lot of rejection along the way to the brass ring. The key is not to give up. When someone says no, you keep on asking. Why? Because when you keep on asking – even the same person again and again – you might get a yes…. When you have paid your dues!!!! When the economy is better. This means that 94% of all sales people quit after the fourth call. But 60% of all sales are made after the fourth call. This revealing statistic shows that 94% of all sales people don’t give themselves a chance at 60% of the prospective buyers. You may have the capacity, but you also have the have the tenacity. To be successful, you have to ask, ask, ask, ask, ask!! Wishing you amazing success and intense richness in 2019. This week in India we celebrate the festival of lights and prosperity – Deepawali. 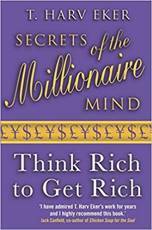 Ajay, a school classmate, shared a book: Secrets of the Millionaire mind by T. Harv Eker, quite appropriate to the season! This book provides a missing link between ‘desire’ and ‘current achievement’ of financial success. It is worth reading if you see a gap in this area of your life. The author has gone from “struggling to make both ends meet” to “being a multi-millionaire”. He has helped thousands of people transform their financial blue print and bring prosperity in their lives. He summarizes: if your subconscious “financial blueprint” is not “set” for success, nothing you learn, nothing you know, and nothing you do will make much of a difference. There are at least 4 realms in our life – physical, mental, emotional and spiritual worlds. They physical realm is merely a ‘print out’ of the other three. Say, you create a document on the computer and print it out. You discover a typo in the print out. You use an eraser and correct the typo. Next time you print the document, you get the typo again. You attend a workshop on ‘effective erasing’. With all the acquired tools and knowledge, you erase the typo. Next time you print the document – same typo!! The real typo has to be corrected in the word document. What’s going on here is that the real problem cannot be changed in the “print out”, the physical world; it can only be changed in the “program”, the mental, emotional and spiritual worlds. … Imagine you are walking along the street with a five-year old. You come across an ice cream store and go inside. You get the child a single scoop of ice cream on a cone because they don’t have any cups. As the two of you walk outside, you notice the cone wobbling in the child’s tiny hands and, all of a sudden, plop. The ice cream falls out of the cone onto the pavement. Now here is the question. Being the kind, loving, and generous person that you are, would you go ahead and get this child the triple scooper? Your initial response might be “sure”. However, when considering the question a little more deeply, most of our seminar participants respond; “No.” Because why would you want to set the child up to fail? The child couldn’t even handle a single scoop, how could the child possible handle a triple scoop? This book also points out ways to trace, understand and transform your financial blueprint. My wife has been advising me to transform my relationship with money to reach my true financial potential. So far, I have been struggling to find a way that works for me. This book gave me some definite answers. May this book help you reach your true financial potential.